*Sun	The Sun represents knowledge that upholds two hundred percent of life, the best of the Absolute Reality as well as the best of its relative values. *One of the significations of the planet Saturn, when it governs the field of career or professional life, is architecture. *Surya Yoga	Surya Yogins want two-hundred percent of life — the best of both worlds, spiritual and material. They also delight in shining like the Sun and demonstrating their spiritual values through dynamic leadership in the world. *When the energy body (mental health) is weak, then the person finds it hard to project himself into his environment. He is shy and lacking in confidence, or very attached to action and its fruits — so much so that he may act like a headless chicken. One client who has this weakness is always busy doing something, but often in a chaotic or ineffective way. Another client with the same weakness gets so caught up in wanting to be successful and influential that he can’t stay focused or balanced. *If the Sun governs this field of living, then the person should have an environment in which he feels like a king or master. A rented apartment with an oppressive landlord will never do! There should be a lot of sunlight in the structure, as well as a sense of expansiveness and openness. Many of the design features will be slightly avant-garde, on the cutting edge of design principles. Integration of the various principles will be a key feature. The overall effect will be grand and dignified. To put it simply, the house will appear solar! *This strategy of joining others in order to overcome a weak spot applies to each field of living. For example, if someone is not good at earning income and achieving wealth, he or she should join groups who are trying to achieve this objective in common. Then the individual weaknesses are ameliorated by the strengths of the group. I can’t emphasize this strategy enough! *When you watch true friends interact, you will find that they don’t demand anything from one another. They meet where it is a joy to meet and they do separate things without feeling guilty for not including their friend. *This field of living defines are most primal desires for temporal fulfillment. After all, what is wealth but what we value as wealth. The problem with the planet governing this field is that it always promises more than it delivers, at least in terms of lasting fulfillment. It seeks to usurp the spiritual life by suggesting that its way will bring greater spiritual benefit than the way offered by the planet governing the spiritual life. *According to the ancient system of Tantra — as interpreted and tailored by The Art of Multi-Dimensional Living — there are 112 techniques for God-Realization, sixteen for each of the seven yogas (16 x 7 = 112). Some of these techniques are more appropriate for one person and some for another. To offer the self-remembering technique, which is just one of 112 possible choices, and primarily suitable only for those on the path of Gyana Yoga, as a universal prescription for spiritual enlightenment, is the worst possible violation of The Art of Multi-Dimensional Living as applied to the spiritual life. Beyond this I have nothing more to say. *Steiner suggested that Christ was a great spiritual being who came from the Sun in order to offset the untimely Luciferic influence in human evolution and the schemes of Ahriman to keep human beings rooted in materialism. He performed a great sacrifice on behalf of humanity the fruits of which live on in the etheric body of the earth and the human ego. Without this sacrifice, Steiner felt that it was highly unlikely that human beings could have continued to evolve to higher states of awareness. Human evolution would have reached a standstill! *Those who deny the role of a strong, well-integrated personality in the process of discovering higher states of consciousness by overemphasizing the “Supreme Teaching” and underemphasizing conventional knowledge, do so at their peril and the peril of those who follow them. *Q: So if a priest is worn out at the end of the day just like and office worker might be, chances are it’s not his dharma to be a priest. *Psychologists have been able to show that when people engage in certain activity without being attached to the fruit of the action, the subconscious starts unraveling in extremely profound ways. And that unraveling of the subconscious is a form of great and deep rest as is any other form. So Raja Yoga is extremely different from Karma Yoga, but if that difference does not result in — we could almost say Karma Yogic rest takes place more during the day, and that more-ness of rest done in a Karma Yogic way makes up for the lack of depth that one might have in Raja Yoga. *…ashrams love to get work out of people. So they started to create the idea of, let’s have a few hours of Karma Yoga each day, and this means you had better serve the ashram because it is part of your spiritual practice to do so. And that’s a tremendous perversion because that turns Karma Yoga into a sense of obligation and duty, whereas really Karma Yoga — who to serve, how to serve, and when to serve — should always be determined by an inner sense of expansiveness and joy. So if it’s a joy and if it gives one a sense of expansion and joy and good feeling to do a particular form of service, then that means it’s appropriate to do it. If it’s done out of an onerous sense of duty, which is more Saturnine in its nature, that means that this form of giving is probably inappropriate. *Q: That’s when the giving would be exhausting rather than joyful giving. *So either they’re not meant to practice Karma Yoga or they’re Karma Yogins who are being wrongly guided for selfish purposes by a particular group that’s trying to turn Karma Yoga into an obligation or duty. And I saw that when I lived down in Crestone, Colorado. There was a community there — a wonderful group of people — but who have this wrong thought of Karma Yoga. So when people come into that ashram they say, well, now you’re supposed to spend three hours doing service and we’ll tell you what to do and how to do it. And that was great for the ashram, but it was ridiculous. It has nothing to do with the practice. And people doing it out of that sense of intimidation or that sense of, well, “I had better do what they say because I’m here on retreat” — they’re not going to gain any benefit from that type of practice. When man lifts himself from the earth-centre of his human nature to the heaven-centre of his spirit and when, in the heart-centre he joyously accepts the obligation to actualise the Original Unity and its inherent order within his existence in this world, the will his insight and practice flow out in one stream of true creative activity on earth. Hara – the Vital Centre of Man. The antidote for any inner challenge is The Great Discovery. Your intuition is always trying to wake you up to the opposite. The antidote for the influence of Saturn and Mars on the Moon is looking for the opposing support. Amazing. The gross or material mentality has to be altered. Tantra says the material mentality can be altered by cultivating the positive and benevolent qualities in life. The qualities that are usually expressed in the material world in the course of interactions are anger, jealousy, envy, hatred, greed, avarice, lethargy and such like. However, when spiritual awareness begins to dawn, these destructive and limiting behaviors have to dissolve and the positive powers of life have to awaken. The positive powers of life include love, compassion, sympathy and understanding. The greatest positive power in life is understanding, not even love. Love is only an expression, understanding is a power. With understanding comes love; in the absence of understanding there is no love. Understanding is the highest quality that one can possess. When there is understanding and a clear mind, one can achieve anything in life. All the problems in family and society arise because of lack of understanding. Misunderstanding takes place between two people and problems occur. Even newlyweds, only two people living in a house, can have a misunderstanding. What does this indicate? That there is a part of your nature which is rigid and does not seek to understand, only enforce its own will. When you try to enforce your own will without understanding, conflicts arise. Therefore, Tantra says that understanding is the key quality which allows the positive and soft attributes to germinate in life. Spiritual awareness comes not with meditation, but with cultivation of understanding. A turbulent history has taught Chinese leaders that not every problem has a solution and that too great an emphasis on total mastery over specific events could upset the harmony of the universe. There were too many potential enemies for the empire ever to live in total security. If China’s fate was relative security, it also implied relative insecurity. Rarely did Chinese statesman risk the outcome of a conflict on a single all-or-nothing clash; elaborate multiyear manoeuvers were closer to their style. 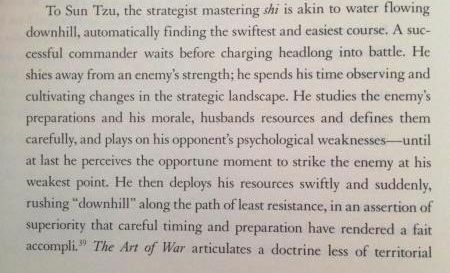 Where the Western tradition prized the decisive clash of forces emphasising feats of heroism, the Chinese ideal stressed subtlety, indirection, and the patient accumulation of relative advantage. You are currently browsing the SunYogi Blog blog archives for June, 2013.